PRODUCT DESCRIPTION: This is the smallest of our three spreaders and is designed to apply granules on lawns and gardens. The granules can be any type of fertilizer or insecticide. All work off the same principle but this is an entry level small spreader designed for light work, the medium one is a step up and can handle a larger work load as well as more granules as well as the deluxe model, with many features. This holding tank is the smallest of the three but it does work and is adequate for most applications of 5,000 feet or less. The other two have large tanks but over all, work the same. 5) All propel granules evenly and consistently. 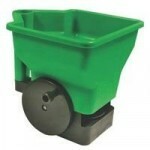 The differences between the three is the entry level spreader is designed for small or light jobs. It's holding tank is the smallest of the three but it does work and is adequate for most applications of 5,000 feet or less.